A great rule of thumb is to ask, “Would I give this to a friend?” This quickly rules out broken or soiled items, as well as those subject to a recall, ban or which fail to meet current safety standards. Full garage, attic, basement or closet? Donate your gently used clothing and household items! Having a yard sale? Donate your unsold yard sale items! Moving? Donate items you don’t want to move into your new home! Redecorating or remodeling? Donate your old items! We gladly accept business donations. If you’re renovating your office, moving your business, please consider donating to Barkin’ Basement. Tell your friends and neighbors and visit the store often! Bring items to the store during store hours or call the store and we can assist with local pickups - 301-777-0826. We love phone calls. Please call Barkin’ Basement if you have questions about your donations. 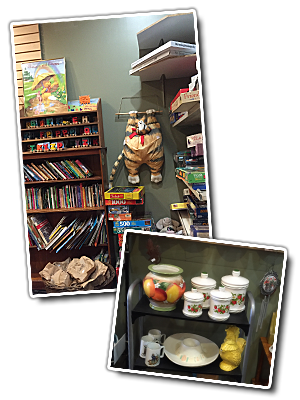 Barkin’ Basement is a non-profit thrift shop and donations are tax deductible. If you would like to use a tax deduction, please ask for a form.